Casual games often use some well known characters or people to attract the audience. It is especially true about the hidden object puzzle adventure genre. And that usually works. This time you get to be involved in Nicola Tesla's project. How cool is that? Fixing this situation happens by traveling back in time and correcting the wrongs. Tesla's Tower: The Wardenclyffe Mystery tells you a story of how one of the projects of this truly mysterious inventor has gone wrong. And if you are a great mind, you mistakes will also be great. This one took away the color from the world. Now it is basicly your job to fix things in the world since the great mind has disappeared. Fixing happens by traveling back in time and correcting the wrongs. Time traveling is also a beloved theme of many gamers. The story is presented with bright and fun animation. It's not like one of those dark game. This one is more of a family kind of games. One of the annoying parts might be the constant help from Tesla. It leaves little place for just wandering around and finding out what to do next. There are no option for the gameplay, so you get parkles anyway. You do get to work with a journal, clues, task lists, and maps. 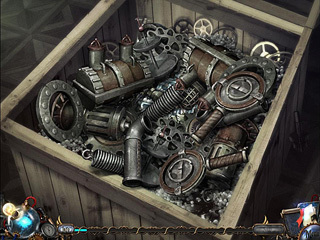 Only a small part of the game is given to the hidden object searches. 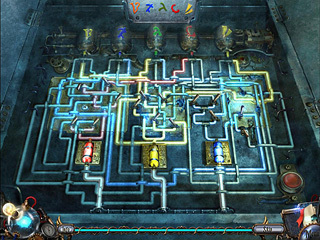 Most of the time you get to solve some puzzles and complete some tasks. They range from too easy to too challenging. I guess it will please every gamer. The game is definitely different from the majority of the games of this genre, and it will definitely find its fans. This is Tesla's Tower:The Wardenclyffe Mystery review. Download this game here.